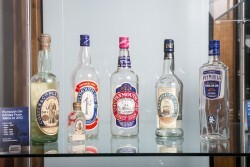 Plymouth Gin is currently showcasing its unique heritage in ‘From Plymouth to the World – the Voyage of Plymouth Gin from Birth to Legend’, an exhibition now open in the heart of its home city at Plymouth City Museum and Art Gallery. Created in partnership with Plymouth City Council, the new exhibition showcases the brand’s 200-year plus history in the city. The exhibition tells the story of the birth of the world’s first promoted ‘dry gin’ and encourages visitors to discover why Plymouth Gin continues to be revered by gin enthusiasts and the bartending community worldwide. Visitors will discover how the City of Plymouth played an important role in the history of gin. As one of the main British trading ports, Plymouth served as the access point for imported essential botanicals for gin production, including the signature botanical – juniper berries from Italy. As new exotic spices, fruits and teas made its way into Britain, a Plymouthian named Thomas Coates took inspiration from four corners of the world to create Plymouth Gin in 1793. Plymouth Gin continues to be made according to the original artisanal method and recipe, which features seven distinctive botanicals – all showcased as part of a multisensory display at the exhibition. To this day, Plymouth Gin is still produced at its original home, Black Friars Distillery, the historic site where the Pilgrim Fathers stayed the night before they set sail for the new world on the Mayflower in 1620. The gin is batch-made using a single copper pot-still originally installed in the distillery during the Victorian era. Also on display are a collection of historic objects from the Plymouth Gin archive, as well as the original lease for the distillery from 1697. ‘From Plymouth to the World – The Voyage of Plymouth Gin from Birth to Legend’ is free to visit and will run from 29th June to 31st October, before it tours around the world. 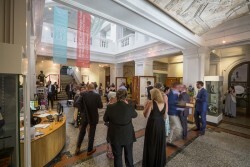 The Plymouth City Museum and Art Gallery (Drake Circus, Plymouth PL4 8AJ) is open Tuesdays from 10:00am to 5:30pm to Saturdays from 10:00am to 5:00pm. Complete the Plymouth Gin experience by visiting The Black Friar’s Distillery (Black Friars Distillery, 60 Southside Street, The Barbican, Plymouth PL1 2LQ) open seven days a week. Tours can be booked at http://plymouthdistillery.com/. To discover more about Plymouth Gin, visit http://plymouthgin.com/.